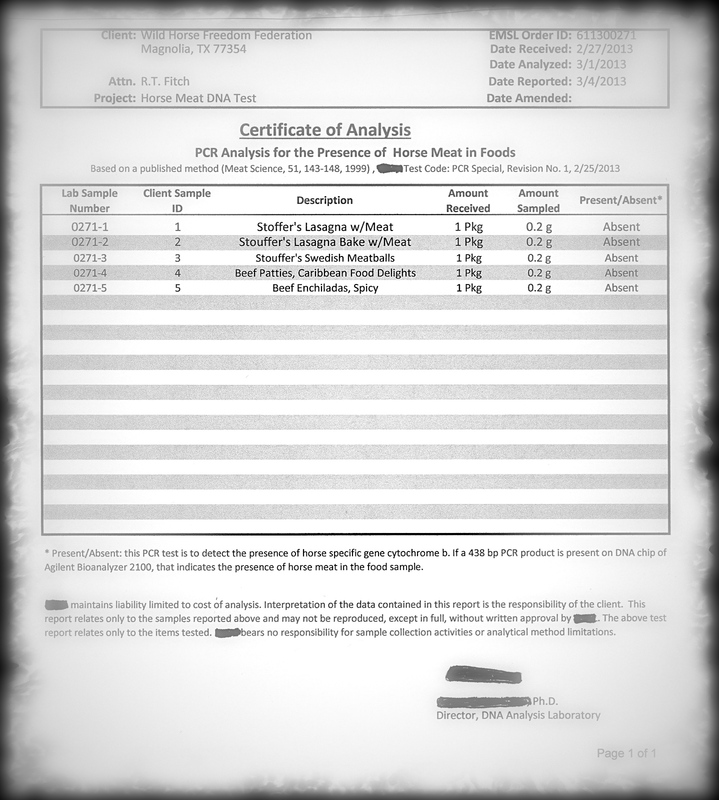 (Houston) – Habitat for Horses (HfH) and Wild Horse Freedom Federation (WHFF) have taken action to monitor and test processed ground beef products that are similar to those pulled from European store shelves due to contamination with tainted horsemeat in the ever expanding ground beef/horsemeat scandal that now engulfs 16 nations. Long time advocates against horse slaughter president of HfH, Jerry Finch, and R.T. Fitch, president of WHFF, teamed up to begin a monitoring program of processed frozen foods that have ties to overseas markets. Jerry Finch said, “My feelings about all of this are sort of a mixed bag; part of me wants the tests to come back negative so that we know our U.S. human food chain is safe and the other wants a positive so that we can point the finger, expose the fraud and be done with all of this nonsense. The above unaltered samples were purchased at a Houston Texas Walmart, packed in dry ice and overnighted, with appropriate chain of custody in force, to an analytical lab specializing in testing for varied forms of animal DNA. HfH and WHFF are pleased to report that the analysis of these five products has come back negative on all counts. HfH and WHFF will continue their program of testing potentially suspect processed foods in an effort to expose fraud and abuse while protecting the health and safety of the American public. Still I’ve elimated beef from my diet. Buitoni products have been reduced by 50% and Burger King is promoting drastic sale promos (especially whopper jr.). pretty much eliminated all meat now that I know how cruelly the animals are treated. But with this testing now I won’t want to upchuck everytime I enter the frozen food aisle. I heart you and i agree with you. I’m not eating admiring frozen and prepackaged. Not eating any sauce with meat in it, can’t trust them. I lived without meat before so it’s easy to do now. I’m boycotting meat. Yay, Inspectors R.T. and Jerry Clouseau! Yay, LNorman and MorganG and Terry R.: the sweet cows ‘n’ pigs ‘n’ chickens ‘n’ turkeys of the world want to “friend” you, I’m sure! Sad when I can trust food more with RT & Jerry on the job than I can with the USDA on the job. Thanks for taking care of us guys. I have the same mixed feelings about finding it over here, but I’m happy for the result. I don’t think they even realize what a negative impact allowing horse slaughter is going to have on the legitimate meat industry in this country. the beef industry surely doesn’t recognize it as they joined the lawsuit by that idiot from New Mexico. I wouldn’t go near him if I were the meat industry. They’re cutting their own throats. I can’t even comprehend why they’re doing it either. I think there afraid that if there seen siding with us–then somehow they’ll be next. That’s why this fight is this way. To me it isn’t. I want a hamburger–I buy beef. I don’t want horse period. Oh the other thought I had was this. In relation to horse slaughter–ban it. Be done with it. There is no reason why America should foot the bill for other countries to munch on our horses. They want horse let them raise and slaughter their own. In regards to those in this country who want to eat horse (super gross me out). This one in my opinion should be easy. Person PAYS to have that meat shipped to their home. They pay any and all fees associated with it. But its not American horse–its something else. As for Skye McNiel if anyone heard her yesterday she sounded like she was the horse savior of the planet with her bloodletting. Rep Armes–not sure who he was speaking to when he said something about animal rights groups have all these millions (something to that effect). I don’t know about any of you but millions doesn’t exactly describe my checking acct.! Surely they don’t or they wouldn’t be doing it. But, my question is HOW CAN THEY BE SO DUMB? Shedrowconfessions and Morgan G., have “said it all! !” Only verifiable pure beef, and very little at that, for me!! Perhaps our politicians, all the way to the top, should be consulting R.T. I have stopped eating meat because of this scandal. Thanks for being on top of it with testing. I still feel it’s hiding in our food chain. A cheap filler. A euro friend told me they sell horse pepperoni Anne salami inn Czech grocery stores. They are square. Yick! On the news this morning it was posted that processed meats i.e. Ham, bacon and sausage lead to cancer and heart disease due to the drugs pumped into the pig. Good work! What ever the results this is what needed to be done! I am off beef in general and all processed foods. Thank you for doing this!!!! Yes! I’m glad to see that it came back negative? I’m still not trusting the USDA in the event that horses start being slaughtered in this country. I never want to be exposed to horse meat on my plate and am boycotting the beef industry because of their interest in killing horses. They need to mind their own business and stay out of ours! Glad to hear of the testing, I would love to see somebody test the ground beef sold @ Kmart- my family tried it a while back and it was DEFINITELY not beef. I personally do not eat meat but other family members were wondering if it was pork mix but hoping it wasnt horse… tasted “sweet” and had an odd texture and color. It was fresh, not rotten, but just obviously not beef. Needless to say we threw it away and will not buy it again. It would be great if someone would test it!! I don’t eat any beef unless it comes from my own grass fed chemical free animals. I haven’t trusted beef since my neighbor died of creutzfeldt jacobs disease (mad cow in humans). Which DNA testing service are you using???? Products that I saw on my little foray to the market to the other day showed Digornio pizza is distributed by Nestles. Lean Cuisine is. Hot Pocket are. Pizza can be overcome by other things. I don’t have to eat Digornio. Costco for me is a couple miles further than the grocery store and they make a great cheese pizza. Lean Cuisine–the Swedish meatballs–that one I have to work on. But I’m certain with a little ingenuity I can do this. And Hot Pockets–that’s super easy to overcome. Get a tortilla, your favorite meat–chop it up real small, use some cheese. Heat it in the microwave and roll it. Voila! Homemade hot pocket! Frozen french fries look to be just fine. Alexia is distributed by themselves. They’re a great product. And Dannon Yogurt looks to be fine also. I don’t know how to do a database or keep one for all to see. But perhaps making one would be great. Like IKEA–where and what products do they sell? Personally I’ve never seen one of their products–but up until recently I’ve never questioned distributors. Taco Bell and Burger King…I don’t know what to say. It’s great to say there sorry but to me the damage is done. I won’t eat at Taco Bell because of this. And Burger King lost my business with all the animal abuse shown on the net last fall. Someone correct me if I’m wrong here. It seems for us omnivores–that buying refrigerated beef–I guess referred to as fresh–is the safest. It’s the prepackaged, frozen stuff that should be in question. That means for now–ground turkey and chicken are safe. Not frozen. Oh and the last oranges I got from Costco? They were labeled oranges, they were orange BUT OH MY GOD WERE THEY SOUR! I’m talking more sour than lemons. Were they messed with? I don’t know but sweet is not the word I’d use for what that box was. I learned to read labels long ago. When you see any label that says distributed by always contact the company and ask where their product is grown or packed. I started doing this when so much of the canned food was shipped here from China. I boycott all Chinese food products, I don’t care what it is. I also don’t buy food products from India since I found out about their hygiene. They don’t use t-paper. I would guess they are to poor to buy it. I’m not going into any detail about what they do, but I boycott all of it. I’m not trying to start any trouble hear, but bear with me — we have an IKEA store here in Cenennial, Colorado it is only a couple of miles from where we are living right now and we all have read here that in other countries IKEA has been caught serving horse meat – there was an ordinance in Centennial that signs could only be 30 feet high, well IKEA told Centennial that if they wanted the store here they had to change the height limit, so they did and we now have an ugly big blue IKEA store and a big ugly blue IKEA sign 90 feet high, blocks the view of the mountains from I 25 and here is another gripe I have when you are going down I 25 you see the US flag, the Colorado flag and the Swedish flag all the same size and all flying at the same height(I thought it was a federal offence to not fly the US flag higher, but you cannot get anywere on that question). So I ask you if IKEA was found to be serving horse meat in the US would they ever have to even own up to it or would they just get away with that too? Margaret—I have not been to the IKEA here because they got a 10 year tax exemption for coming here, I only shop at Colorado tax paying companies. But they advertized on the radio for awhile free breakfasts for seniors, so they serve food in a restarant, but don’t know if they have a food store. I bought a roll of ground chuck at WalMart just before the scandal happened to make chili.Just can’t stand the idea of using it now. It does say it has meat from Canada in it. Guess its just going to sit there. I’d return it and demand my money back. Then I’d go to Costco or elsewhere and buy Organic beef. Organic beef from Costco if I remember right is from USA, Canada and Australia. But heaven only knows if 1 it is Organic and 2 the label is truthful. So I’m staying with ground turkey and chicken. Last week The Biggest Loser showed one of the kids who wouldn’t touch veggies period. They gave mom this recipe with ground turkey and she made a turkey loaf with veggies. I spent a couple of days looking around for it. TBL never posted it unfortunately. It looks like blenderized brussell sprouts and carrots. When you mix them up in the blender it looks like split pea soup. Mix that with brown rice and the ground turkey. It sounds good enough that I’ll even try it. Have the fixings for it! Thank you, Jerry and R.T. This brings up the larger question that just because a label says one thing, we have no way of knowing whether it is true or not. When profit is the motive, the name of the game is cutting corners and maximizing the return. Disgusting. We are probably reasonably safe here because horse meat isn’t readily available inside the US – yet. If it ever gets going on US soil again, watch beef slide right off the charts. Good enough for ’em. They have infuriated me with their interfering with getting horse slaughter shut down. Maybe that’s their reason – want to up their profit margin by using a bit of horse meat filler. YUK! Thanks for a great job, R.T. and Jerry! I only hope you make the beef guys head’s explode. Thank you so much R.T. and Jerry!! !